Simplicity - The "Minus 1" approach to business and organisation development. In musical speak Lou Reed pointed out that any more than two chords is jazz! Brevity - For example, making communications more persuasive by making them shorter and more potent. The average punk song is less than 3 minutes long. How can you use that as a spur to better communication? Authenticity - A hallmark of great leadership is purity of communication and a lack of a gap between what is said and what is done. 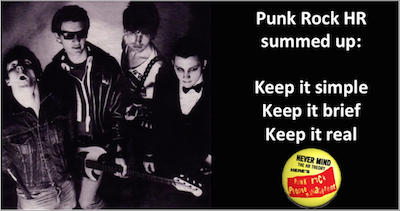 As well as the Punk Rock Principles, we are often asked to give a rapid digest to the main elements of Punk Rock HR: HR Strategy and Practice; Attracting and Engaging Talent; Bringing people on board that want to bring their heads, hearts and souls to work; Cutting the crap from Motivational theory and practice; Getting assessment and appraisal right; Disruptive innovation unplugged; Dealing with conflict and internal strife etc. There's no need to pogo or apply safety pins to your pin stripe suits to attend a Punk Rock Business masterclass. Just a willingness to open your mind to better ways of doing business and people management.